There's no doubt that we're moving toward a more visual marketing world. As users, we often prefer consuming visual content to reading blocks of text. In fact, Facebook users are uploading approximately 300 million photos to Facebook per day, up 20% from earlier this year. Even usage of the photo-sharing tool Instagram, purchased by Facebook in April of 2012, has increased 1,179% in six months. But as a business, will catering to this new trend in visual content have a positive impact on crucial engagement metrics, including Facebook Likes, comments, and potentially even link clicks? To learn if using visuals in social content has an impact on social media engagement, HubSpot evaluated 8,800 Facebook posts from B2B and B2C companies' Facebook Pages in October 2012 by comparing each businesses' average Likes-per-photo to their overall average Likes-per-post. As a result, our study revealed that photos on Facebook Pages received 53% more Likes than the average post. We also compared each businesses' average comments-per-photo to their overall average comments-per-post and found that photo posts attracted 104% more comments than the average post, too. This percentage difference is substantial, and it emphasizes a huge opportunity for businesses to use photos and images as a means to increase Likes and comments, and thus EdgeRank. EdgeRank is Facebook's visibility algorithm based on users' interaction with your Facebook Page content. Boosts in Likes helps increase EdgeRank, which can then cause a page's content to appear in News Feeds more often, increasing visibility. It's no wonder photo posts garner more attention from Facebook users! But at the end of the day, marketers care more about how their social network usage is affecting specific business goals (as they should! ), such as generating website traffic. So, can visuals be used to increase website traffic as well, even if the link accompanying a photo/image only lives in the image description? Our next logical step was to analyze how using Facebook photos impacts link clicks, but we came to a staggering hault when we discovered that 60% of the photo/image posts in our sample didn't include a link. This discovery not only reduced our sample size immensly -- making accurate clickthrough analysis impossible -- but it also highlighted a huge missed opportunity for marketers. 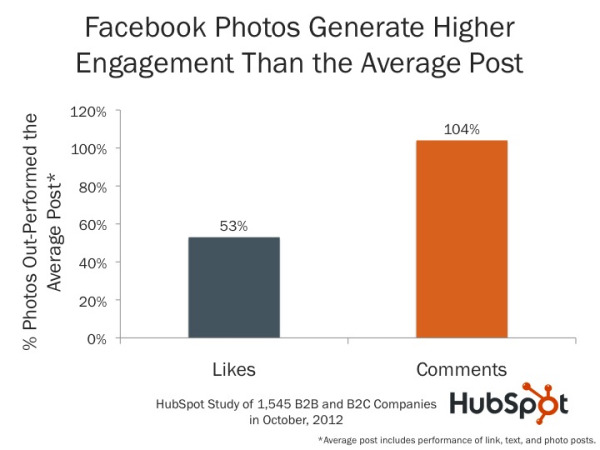 In order to shed some light on the subject, we looked at HubSpot's own Facebook posts from October 2012 and found that our photo posts received 84% more link clicks than our text and link posts. That's right -- even posts in which the featured item *is* a link. Pretty incredible, right? This shows that marketers who are using interesting images to their advantage can increase traffic to their websites -- just as long as they remember to include links! So, what does this mean for marketers? For one, it might challenge some initial theories that using text-only posts could be a better Facebook strategy for businesses. (The contradicting argument is that Facebook surfaces text-only posts in News Feeds more often than photos.) While this specific HubSpot study does not discredit that theory, it could proove that it is irrelevant. Even *if* photos were appearing in News Feeds less often via Facebook's EdgeRank algorithm, using photos to generate more Likes and potentially clicks would justify an increased focus on images. 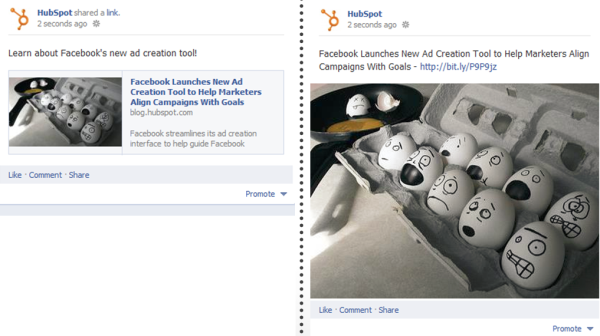 1) If you haven't yet, it's time to increase the amount of visuals in your Facebook posts. This means that you should be making a conscious effort to use high-quality, engaging images in the content you end up sharing on Facebook, including blog posts, landing pages, etc. And feel free to get creative. For example, we posted a photo of a HubSpot employee from his days in the Navy band as a tribute to Veterans Day, and it was one of our top-performing post in November. Don't be afraid to have fun with your photos! 2) Consider hiring a designer or visual content creator. Do you have budget to hire a new marketer in 2013? Visual skills are becoming incredibly crucial in the social world. If a new hire isn't in your immediate future, perhaps invest in some design training for your team. 3) Don't forget to include relevant links with your images. Do you have a blog post, ebook, whitepaper, case study, or landing page that is related to an image you're posting to Facebook? Include a link to it in the image description. This will help ensure you're driving solid traffic back to your website from your visual content efforts in social media. Have you increased the amount of visual content you post to Facebook and other social networks? Have you noticed that your most visual content performs better than other types of social updates?